"Ownership" and the Rights of "Private Property"
Are the Consequences of our Decisions Reversible? IS A "PARADIGM SHIFT" OCCURRING? "The book you are holding is part of a series on the various aspects of social-environmental sustainability. Land-Use Planning For Sustainable Development focuses on the primacy and quality of relationships among people sharing a particular place and between those people and their environment. "Development" means personal and social transformation to a higher level of consciousness and a greater responsibility toward the next generation. "Sustainability" is the act whereby one generation saves options by passing them to the next generation, which saves options by passing them to the next, and so on. In writing this book, we are reminded of a comment author Scott Nearing noted many years ago when he wrote on a small card, "The majority will always be for caution, hesitation, and the status quo-always against creation and innovation. The innovator—he [or she] who leaves the beaten track—must therefore always be a minoritarian-always be an object of opposition, scorn, hatred. It is part of the price he [or she] must pay for the ecstasy that accompanies creative thinking and acting." 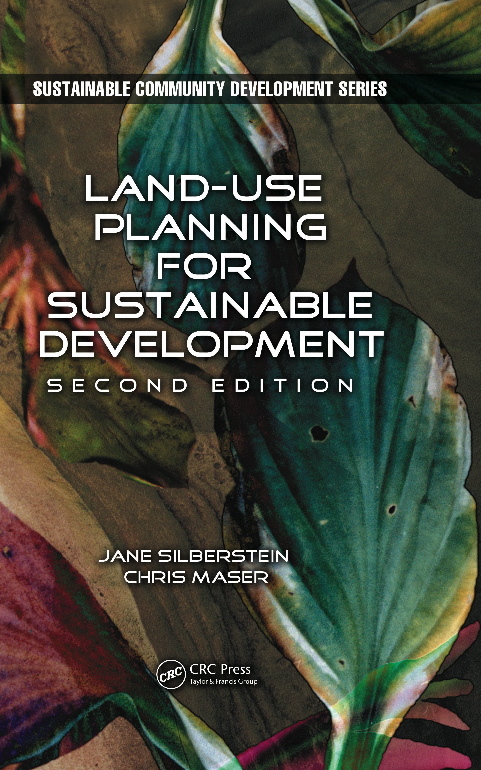 As the title of this book implies, Land-use Planning for Sustainable Development, is part of our human journey toward the ideal of social-environmental sustainability as an unconditional gift from the present generation to those of the future. Although some people are quick to point out that ideas, such as those expressed in this book, are against what society has come to unquestioningly accept as "human nature," we disagree. This notion is unacceptable when our present course is inextricably impoverishing each successive generation. Besides, those who are afraid of change inevitable point to ideas that differ from their own and say they are impractical. However, so-called "impracticality" is merely a horizon of ideas that have not yet been tested. Until they are, how does one know they are 'impractical?'" "Society's understanding of sustainability has evolved, along with that the language that most clearly conveys its meaning. Efforts toward social-environmental sustainability have become more urgent with an increased research focus on systems-based innovation, and noteworthy legislation. This new edition captures the most current success stories and explains the relationship between innovative land use planning and nature's impartial, inviolate biophysical principles that govern the outcome of all planning. It focuses on how decision making that flows from and aligns with nature's biophysical principles benefits all generations by consciously protecting and maintaining social-environmental sustainability. "—Publisher's description. "A comprehensive and visionary approach to land-use planning that grounds the unfolding of human communities and economies within an underlying matrix of living systems. This book should help reinvigorate the planning profession at a time of unprecedented change, complexity, and need for resilience." "Silberstein and Maser help us imagine a world in which life is valued more than money, and the purpose of business is to serve people, community, and nature." "Must read this book, must read it!! Silberstein and Maser have written a must-read book for anyone interested in local community-planning with a definite sustainability twist. I read it for a paper on sustainable participation and found it to be quite easy to read; plenty of case examples and thought-provoking ideas make sure of that. I especially liked reading about the everyday problems that are so common in community-planning, it makes it easy to relate to." "excellent piece of work... brilliantly written and thoroughly referenced."